Ichiro acknowledges cheers at Yankee Stadium after hitting his 4,000th hit as a professional on Aug. 21, 2013. The good people of Seattle have suffered earthquakes. They have endured 40 days and 40 nights of rain. They have long wandered in search of the promised land that is the World Series. They have built a new temple only to learn they have been worshipping false gods. Why have you forsaken us, A-Rod? Verily, a saviour is delivered unto them. He is a man as modest in stature as he is in demeanour. His glove is golden and his arm is true. He hits and he runs and he performs miracles on the baseball diamond. He is known by a single name, as was once the great Babe. The Seattle Mariners rookie right-fielder from Japan has hit safely in 29 of Seattle's 31 games. He brings a 13-game hitting streak into tonight's game in Boston. His average is above .500 when runners are in scoring position. He has more hits than anyone in baseball. "It's like he's playing T-ball out there," centre-fielder Mike Cameron said. "He hits wherever he wants to whenever he wants to." The Toronto Blue Jays pitching staff got a taste of Seattle's leadoff batter this weekend, as Ichiro went 5-for-13, including a double and a triple with four runs scored. Seattle is in Toronto for a three-game stand at SkyDome beginning Friday. Ichiro, who bats left, has an odd, slashing swing. He reaches for the ball even as the rest of his body seems in a hurry to get down the first-base line. He bails out, a cardinal sin. Every hitting coach in the majors is shaking his head in disbelief. You're not supposed to be able to drive the ball that way, yet Ichiro strokes the ball precisely into the outfield gaps. The usual rules no longer apply. Last week, Ichiro stole third base against the catcher's throw -- standing up! Even a Little Leaguer knows you're supposed to slide. "We mentioned it to him," manager Lou Piniella said with a father's indulgent what-can-you-do-about-it shrug. Ichiro's most remarkable play this young season is called The Throw and the entire American League is talking about it. "I saw that throw of his on the highlight shows," Boston Red Sox manager Jimy Williams said, punctuating his sentence with a high whistle. "That was really something." Oakland's Terrence Long had dared to try for an extra base and Ichiro threw a low strike to third from right field. Long was out before he began his slide; he looked like Charlie Brown on the base path. Ichiro later told his translator that he did not understand why Long had run "when I was going to throw him out." Not surprisingly, Seattle is in the grip of Ichiro fever. His feats lead every newscast, his picture graces every sports page. Mariners fans feel burned for worshipping shortstop Alex Rodriguez only to learn of his mercenary's fidelity. Before him, they were spurned by Randy Johnson and Ken Griffey Jr. in trades dictated by the wild economics of baseball free agentry. Ichiro is balm for the broken-hearted. The Mariners paid US$13.1-million to the Orix Blue Wave of Kobe, Japan, simply for the right to negotiate with him. 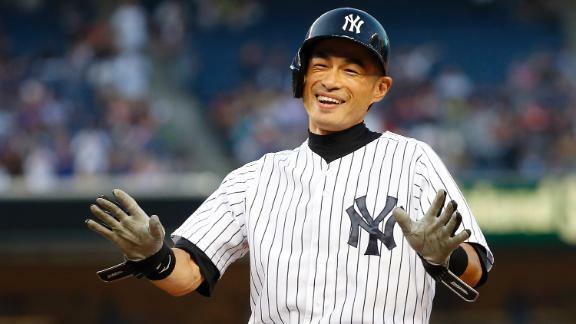 Ichiro himself signed a three-year, US$14-million contract, which will likely be a bargain for Seattle. He is the first positional player from Japan to play in the major leagues. Ichiro's fame in Japan is hard to fathom. He is a household name, a Michael Jordan, a Tiger Woods, a Brad Pitt and a Mel Gibson rolled into one, a star athlete with movie star looks and a reputation as a friendly sort. A normal life had become impossible in his homeland. He was mobbed by fans when spotted in public. Life was a series of late-night rendezvous through service entrances at the finest restaurants. The gossip columns were filled with his latest romances with movie starlets, even after he began steadily dating a TV announcer seven years his senior. The couple, who met when Yumiko Fukushima interviewed him for a radio program, had to secretly wed in Los Angeles two years ago. Ichiro Suzuki was born in Kasugai, Aichi prefecture, on Oct. 22, 1973. Legend has it he first started playing baseball at age three. He was obsessed with the game. Even though the strict Japanese education system only allowed for baseball on weekends, young Ichiro made his father practise with him every night. He first played in the Japanese major leagues at age 19. A manager impressed by his unique style of play indulged his wish to be known simply as Ichiro. Suzuki is a common surname. Ichiro is an old-fashioned Japanese name given to a first-born son. He hit like Cobb, winning the Pacific League batting title for seven consecutive seasons. His farewell campaign ended at a lifetime best .387, pushing his career mark to .353. He also was awarded seven consecutive gold gloves. In 1999, he didn't commit a single error in the 103 games he played. So unpleasant had life become in Japan that he spent his off-seasons in Los Angeles. On an early trip to Seattle, he and his wife were amazed to be able to shop at Nordstrom's department store without being bothered. The same likely wouldn't happen today. Fans at Safeco Field wave signs reading "Ichiro Ichiban!" (No. 1) and the scoreboard flashes "Ichi-riffic!" and "Ichi-palooza!" when he gets a hit. Those seeking relics of their saintly hero can buy Ichiro pins ($7), pennants ($6), magnets ($9), keychains ($6), travel mugs ($9), mouse pads ($10), T-shirts ($16) and replica No. 51 uniforms ($120). "His batting is so very nice," gushed 29-year-old Hitomi Harada of Hiroshima, who travelled from her home in Vancouver to cheer Ichiro from Section 108 of the bleachers. "Also, he is so handsome and so smart." David Ishii, 66, whose antiquarian bookstore is a long fly ball from the stadium, has seen few players as disruptive to an opponent as Ichiro. "The game revolves around him when he gets on base." For someone who was once demonized by his own countrymen, the worship of Ichiro and fellow Japanese countryman Kazuhiro Sasaki, the Mariners' star relief pitcher, is a marvel. "It's a bit of a turning point." Even the Washington State Senate has got in on the adulation, unanimously passing a motion that "Kazu and Ichiro Suzuki are undeniably the most fun Japanese imports since Nintendo." Sasaki, 33, was American League rookie of the year last season with 37 saves. He already has 14 this season, making him the AL's premier ririfu pitcha. While Ichiro seems all business, Sasaki seems all play. At 6- foot-4, 220 pounds, he is a giant by Japanese standards. He credits his mass to his father's job at a milk factory. The NHL's Stanley Cup was brought to Safeco Field recently to promote hockey telecasts on ABC. Sasaki walked over, wrapped his arms around the storied trophy, gave a wide smile, and said: "For me? Thank you." Sasaki is a prankster. The club's mascot is the Mariner Moose, a fuzzy critter with antlers. In the fifth inning of home games, the Moose rides a go-cart along the warning track, playfully squirting fans in the centre-field bleachers. Sasaki recently organized his bullpen mates in an ambush, dumping buckets of water on the unsuspecting Moose. After games, Sasaki entertains the large contingent of reporters from Japan. He even allows his son, Shogo, to climb into his lap and bounce a tennis ball in the locker room. Across the room, Ichiro sits facing his locker-room stall, rubbing a sponge along the thumb of his black leather glove, working the spot where his name is stitched in white. He avoids eye contact with English-speaking reporters, answering two or three questions posed to Mariners scout Hide Sueyoshi. It is as if the interpreter is a priest transmitting the words of a god. Ichiro stands 5-foot-9. He is listed at 160 pounds, but he looks like he'd have to spend a week at a sushi bar to reach that weight. What power he has comes from thick sumo legs that support a wiry frame. One at-bat last week against Frank Castillo of the Red Sox captured how disruptive he can be. Ichiro mistimed one of his swings, sending a dribbler on the grass toward short. By the time the shortstop got to the ball, Ichiro was at first. Infield single. Castillo stepped off the rubber. He threw to first. He threw to first again. He stepped off the rubber again. He looked in for the sign from his catcher, licked his lips, cast one final sidelong glance at Ichiro and, finally, threw a pitch to Mike Cameron, who promptly deposited the ball into the left-field bleachers. "I'm sure he drives the other team crazy is what he does," Cameron said after the game. "We all sit back and laugh in the dugout. "He's like that little go-cart that the Moose be riding around on. You don't know what to expect from this guy, man. Chops one to the third basemen, shoots one into the gap. Who knows? The guy's unbelievable." This handout photograph produced by B.C. Liberal government caucus flaks was published in B.C. newspapers, sometimes without attribution. You will not find a more accomplished figure on the floor of the B.C. Legislature than Andrew Wilkinson. He is a Rhodes Scholar who has go on to become both a lawyer and a physician. He has been a deputy minister. He has been president of the B.C. Civil Liberties Association and of the B.C. Liberal party. In May, the voters of Vancouver-Quilchena elected him to the legislature and, in June, the premier named him minister of technology, innovation and citizens’ services. The man is a walking CV. So, how does so eminent a figure respond when faced with pointed Opposition questions about the scandal surrounding his party’s ethnic outreach campaign? After transforming into a walking-talking Cliché-O-Matic, Wilkinson picked it up a notch the next day by accusing all 34 sitting NDP members of fraud. As a denouement, Wilkinson had second thoughts. He rose to apologize to the House for his “intemperate” remarks. Premier Christy Clark made a surprise cameo this week when sworn in as MLA for Westside-Kelowna. The august ceremony took place overlooking the waters of Vancouver harbour and not of Okanagan Lake in her home-away-from-home riding. To the everlasting embarrassment of British Columbia’s media, such newspapers as the Vancouver Sun and the Victoria Times Colonist published handout photographs of the event released by the B.C. Liberal’s government caucus. The swearing in appears to have taken place within shouting distance of the Vancouver Sun and Province newsrooms. No photographers left on staff? Or no invitation? I can see why the government would like to control its image in the media. I cannot see why the commercial media should play along. Shameful. The upcoming Fantastic Four movie will be filmed in Louisiana instead of British Columbia, a disappointing decision for those who work in the movie industry. Vancouver had been the location for other Marvel movies, such as in the X-Men series. The NDP had campaigned on improving tax breaks for the television and film industry. Christy Clark is a brilliant retail politician, a happy warrior on the hustings, a baby-kissing, hand-shaking, hockey jersey-wearing, red light-avoiding campaigner. (Oops. Forget the last attribute.) Where she can seem indifferent to the hard-slogging work of governance, she clearly delights being in the public eye. Welcome to the four-year-long, permanent campaign. In the May ballot, Christy Clark was Tracy Flick (“Election”), while Adrian Dix started out as “A Perfect Candidate” but wound up as … well, they don’t make movies about too-clever-for-their-own-good frontrunners who blow elections. The NDP leader can find a model for his possible future, for Adrian Dix is Thomas Berger, circa 1969. Some background. In B.C. electoral contests, the New Democrats and their Co-operative Commonwealth Federation predecessors were long a joke, a patsy, a punch line. The social democrats played the Washington Generals to Social Credit’s Harlem Globetrotters. Leader Robert Strachan faced W.A.C. Bennett in four consecutive elections — losing each time. By 1967, Berger got tired of waiting for Strachan to step aside as leader. The old Scottish carpenter fended off the challenge at a leadership convention, only to quit shortly before an impending election in 1969. The leadership convention that followed defined the NDP for generations, as people and factions are still divided between those who backed Berger, a stolid lawyer, and those who supported Dave Barrett, the fiery social worker. Berger won the convention, leading the NDP into a campaign several pundits thought spelled an end to the Socred regime. In the end, the NDP vote stayed about the same, but the party lost four seats and Bennett claimed his seventh consecutive victory. The outcome: The NDP’s vote stayed about the same, though the party lost four seats. To repeat, a leader strong on policy but lacking charisma failed to meet expectations and lost seats instead of knocking over a tired government. Hoo boy, must that sound familiar to frustrated New Democrats. Whether Dix has admitted it to himself yet or not, he will never win election as premier. The voters had a chance to evaluate him and his team in circumstances as favourable as the NDP has ever faced and he failed to win over enough of them. It happens. His leadership is doomed, though not his career. Berger quit to be replaced by Barrett, who would go on to win an overwhelming majority in 1972. (Barrett’s hectic — and historic — three-year government is the subject of “The Art of the Impossible,” a prize-winning book by Geoff Meggs and Rod Mickleburgh.) Berger, who turned 80 earlier this year, has had a distinguished career in which his lack of success as NDP leader is a mere footnote. As for Strachan, he retained his seat in the Legislature and served as highways minister under Barrett. Both offer a possible model for Dix’s future career. The NDP membership has an uncanny talent for selecting leaders non-NDPers find unappealing. Has no one in the party ever read Marshall McLuhan? Or Richard Ben Cramer’s “What It Takes”? Or listened to an episode of Terry O’Reilly’s “The Age of Persuasion” or “Under the Influence” on CBC Radio? So, remember: Wonks in the backroom, glad-handers on the front lines. Congratulations to Michelle Stilwell in setting a world record Thursday at the International Paralympic Committee world championships at Lyon, France. The new MLA for Parksville-Qualicum knocked almost two seconds off the previous mark in the 800-metre wheelchair race. Stilwell is following in the tracks of the late MLA Doug Mowat, who had managed the famed Dueck Powerglides wheelchair basketball team. Both Terry Fox and Rick Hansen played for the championship squad. When do the LNG faeries arrive with all our money? Tom Hawthorn, a frequent contributor to The Tyee, is the author of “Deadlines: Obits of Memorable British Columbians.” He lives in Victoria-Beacon Hill, where the BC Liberal candidate got just 16.96 per cent of the vote, the worst performance by a Liberal in the election.